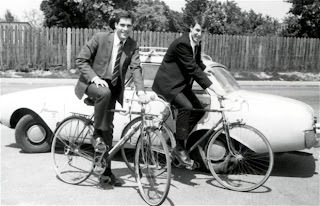 It's nice to see our two presidential candidates here riding their bikes. We know though that this was done more for the picture than because they really bike either for commuting or for sports. Very few people nowadays don't know how to ride a bike. Even though very few of us really bike only for transportation. My boss makes a gigantic operation out of biking. I mean, she mounts the bikes on the car, all the gear, water bottle, map, and who know what else as if going on a space expedition. To begin with, a bicycle is a method of transportation. That means you shouldn't have to put in inside a car (another method of transportation) to then take it to a second place, dismount the bike from the car, mount the bike, go a few miles, come back, etc. You get the picture. Biking should rather be a quite simple activity. Just get on the darn thing and pedal. Perhaps the first mistake I see people making when acquiring a bicycle; when they see the weather changing every year as the summer approaches, is that they get the one bike with the fattest tires and the most gears. Some how that gives them the impression that the wheels will do the pedaling and that the wider the tire, the faster they'll go. Granted, fat cross tires will allow you to get into many more places such as grass, dirt, on and off sidewalks, but the thicker the tire, the more drag it creates, the more vibration and the heavier the bike it will get. Many people quit bicycling because they start out with the wrong bike. One that is uncomfortable or one that makes them look silly. The one bike that makes them also waste a bunch of money on Lycra, carbon, fleece, shoes, etc - just to look official. My personal opinion is that as beginners, we should get a bike, new or used, that is comfortable. A bike that is not expensive. That way, if we don't bike again, if we fall and don't like it anymore, we can just store it in the garage or leave it outside all winter and never lose much money or sleep over how much money we spent on the bicycle that we are no longer using. It could be a comfortable city bike so that we can just jump on it without having to change clothes or shoes. Upright/cruiser/beach/city/comfort bikes allow us to do that. They are not designed for performance. Just to go easy around the park and enjoy ourselves. We shouldn't expect to go fast, nor should we expect them to be light. That is not the point. They should be comfortable and easy to use. If we then feel that biking is our thing and we see that we spend more and more time doing it, we can go and spend the money on an upgrade. The pictures that we have here exemplify exactly that. These two presidential candidates are clearly not the type of commuter/biker that they pretend to be. Mitt Romney in a suit and on a road bike to which he was not used to. It does not even look like he ever rode it on the weekends. A city commuter would not choose that combination of bike and clothing. Good for the picture perhaps. 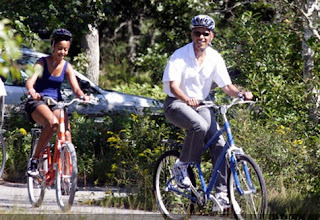 And Obama, riding a bike that's too small for him. His daughter wearing helmet down her neck. When you bike periodically, you get to know your gear because almost every time you wear it, you make small adjustments to it until it fits good. None of these bikers seem to have a clue. I'd say you don't have to be good at everything. Stick to the politics and may best one be the winner.